I am busy thinking of ideas for World Book Day and as Elmer is one of the books that children will receive,I decided that this was an ideal focus for our KS1 and also KS2 Year 3.It is also an ideal opportunity to share with students I train how we link across curriculum areas and can take one focus and develop primary language learning games,songs, role-play and our own writing opportunities - if we just think out of the box a little! With KS1 , we can practise our colours and our colour question"Which colour is it?" with a dice game where we roll the dice and say the question together and then the colour the die lands on. We can pretend to be jungle explorers and hunt round our classroom for coloured elephants.With KS1 let's play "hot and cold" and hide coloured card cut outs of elephants. With KS2 Year 3 let's make it an Elmer treasure hunt and hide our multi coloured elmers around the room and ask two volunteers at a time to follow simple instructions to find the coloured Elmers (left ,right , straight ahead, turn around, stop , hot and cold).The class can hide the elephants and then help you call the directions as the two volunteers look for the elephants. E.L.M.E.R. et puis j’en suis fier. être un éléphant qui de temps en temps deviendrait simplement tout gris. Finally what about with KS2 Year 3 or Year 4 some Elmer totem pole prompt sticks for an Elmer role-play? Here is an example of my Elmer totem pole prompt stick- one between two .It's a coliumn of four picture prompts. You will also need rolled tubes with a letter box cut in it,so you can feed the totem pole prompt stick through slowly and look at each picture.This is the "Elmer explorer" telescope. Each partner takes in turns to be the "Elmer explorer" and with their "jungle telescope " as they feed the totem pole prompt stick through the tube , they can ask a specific question of their partner.The partner looks through the binoculars , see the picture and uses this to help them form their response to the question. and created the book I needed. Firstly I used familiar pictures from the totem poles - so the children can write down famiioar phrases and then I added colour clouds so that the children can then write their own colour sentences about Elmer. 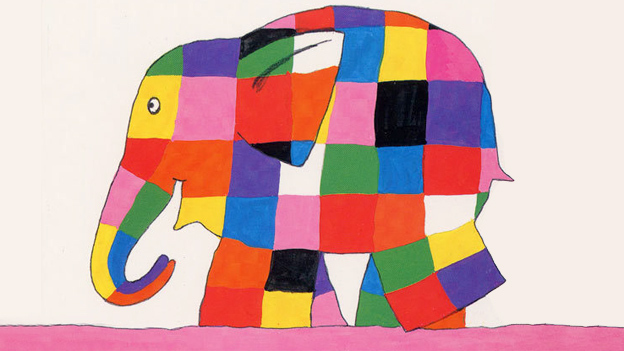 The task in itself will be differentiated by outcome - as some children may write short phrases and single words and other children may write sentences , whilst other children may write questions and answers as if it was a story between Elmer and the narrator. Here are some pictures of my mini book ready to be written in.